Made for the Exhibition “Super Six” curated by Gilbert Grace at DNA Projects in Chippendale. The theme of the exhibition was asbestos. The full HD video is 11 minutes 3 seconds long, and documents my attempts to breath through a plastic bag at various domestic “stations” throughout my house. For a two person show of work developed independently, the exhibition of Vienna Perreno’s “Rainbow Connection” and Yiwon Park’s “Personal Mythologies” at DNA Projects has a surprising continuity. This surprise arrives across the evident disparity between them. Yiwon’s work, a collection of drawings, paintings and small sculptures at the front of the space, is melancholy in tone, while Vienna’s installation at the back can only be described as cheerful. Despite these differences, their combination does not produce the impression of contrast. Instead, the two bodies of work coalesce, drawing on a level of sympathy that exists below that of their evident contradiction. 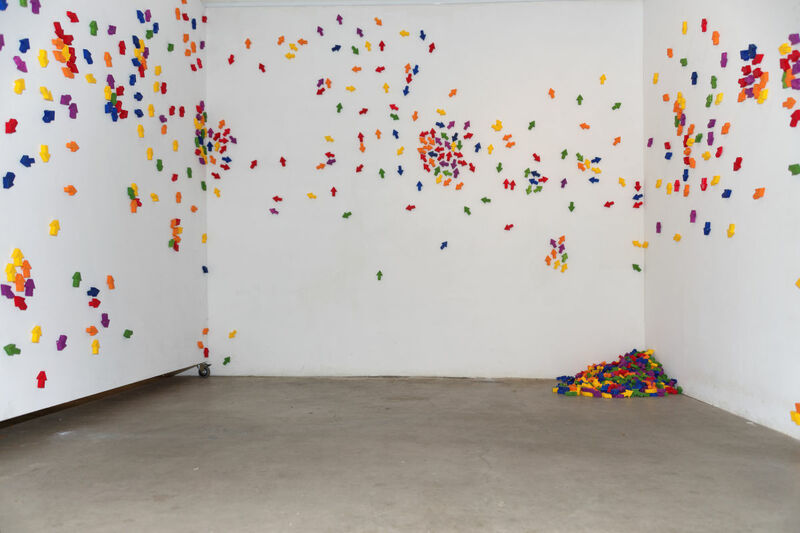 “Rainbow Connection” is a composition of a wall text, two umbrella frames, and an arrangement of small brightly colored arrows crawling across three walls of the space and collected in a pile on the ground in one corner. 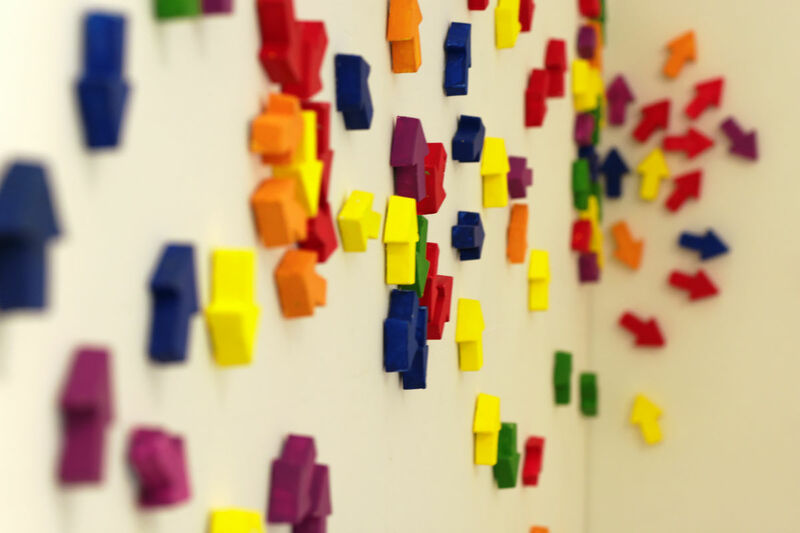 The installation of colored arrows is perceived on approach, swarming over the walls in bright crèche colors like ants of childish aspiration, all headed eagerly in different directions. It resembled a chart describing the currents of weather systems, except the arrows can’t seem to agree on which direction to indicate. The eye follows these arrows happily around the walls, effusive and energetic as children, as they lead you, eventually, to the pile of arrows on the ground. The pile presents a sobering conundrum. Despite, or more to the point, because of the profusion of arrows, you cannot tell whether the arrows are proceeding from the pile up and outward in their optimistic vector or whether they have fallen, exhausted from their manic distraction. 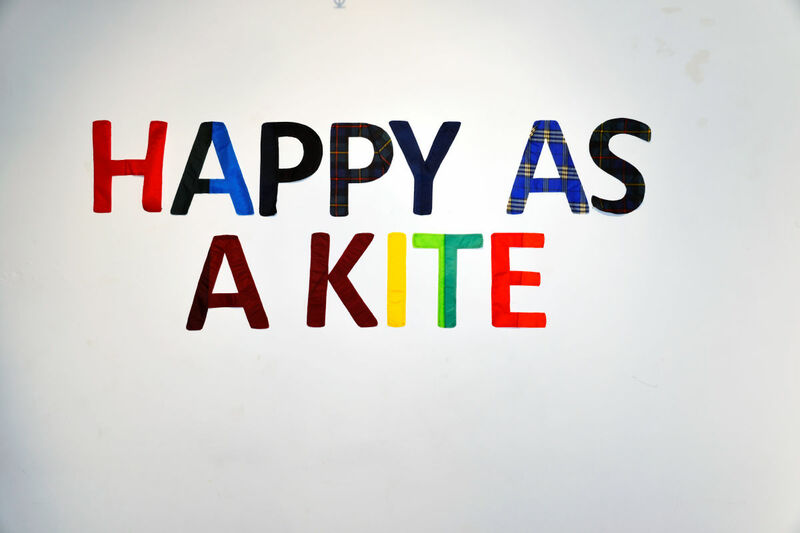 On the wall opposite, the words “Happy as Kite” are written in plastic fabric, each letter of a different color or design, and all of it as optimistic as the arrangement of arrows. Two umbrella frames stripped of their canopy (it is this material that has gone to make up the text), lean against another wall, their neatly machined black ribs slightly splayed around their spines, topped by wooden handles painted in the same cheerful colors that inflect the rest of the work. These skeletal remains, reduced to purely formal objects, are at once beautiful and useless. 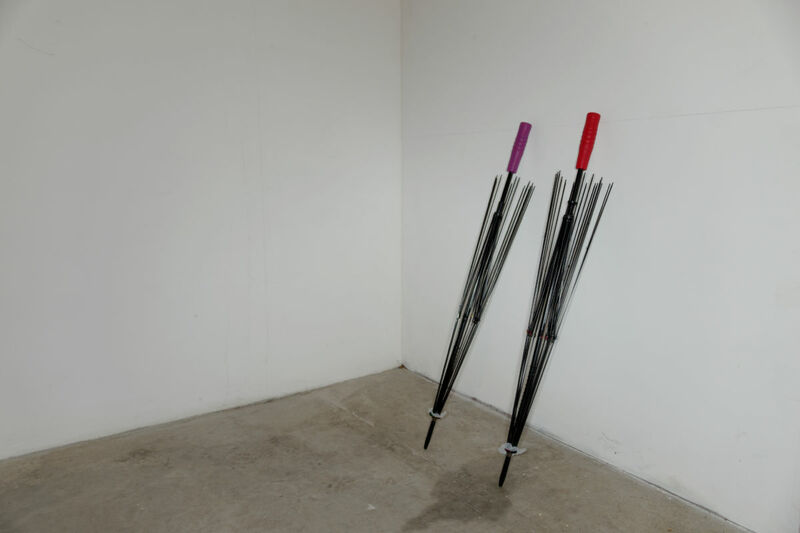 They remark upon the relationship between weather and mood evoked by the metaphors circulating in this work: these umbrellas stripped of their protective capacity to serve an expression of joy. This tension between the text and subtext runs throughout the work, disturbing the effusion of its happy surface with an awareness of its precariousness, its fleeting nature, and the costs of those disappointments we face in its pursuit. The result is a work that, in all its elements and parts, is an expression of joy, but a joy sobered by what is not there. The reality principle, informed by painful experience, that says one must protect oneself from bad weather, is excluded in these objects of optimistic abandon. And yet, from its position of absence, it speaks all the more potently, not to contradict the joyfulness of its expression, but to temper it like an alloy, into something strong. It makes of this happiness an act of courage, a kite that flies because it sails into the wind. 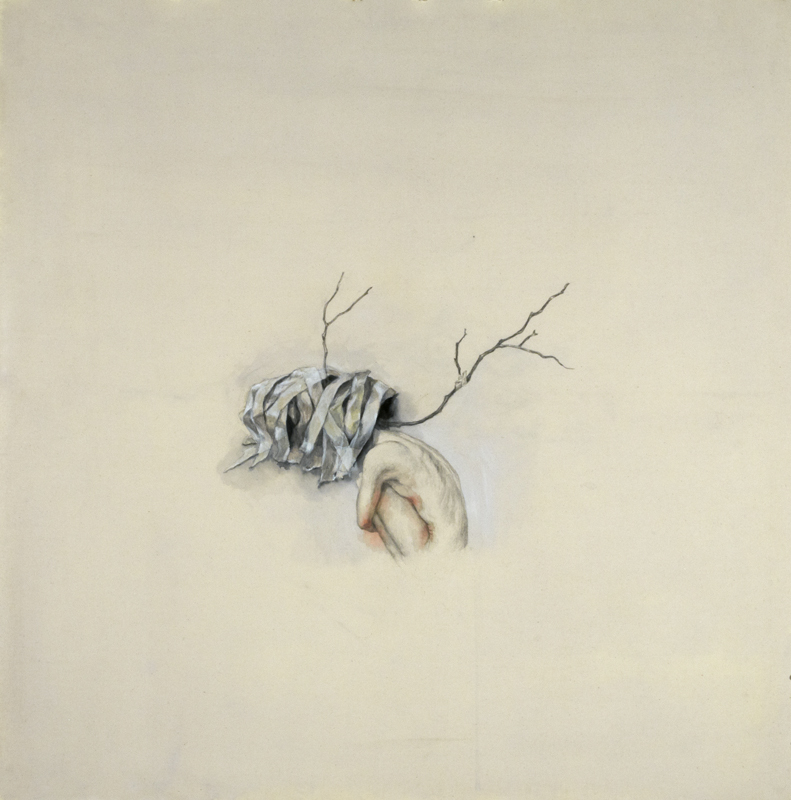 Yiwon Park, on the other hand, has produced a series of objects that emit an atmosphere of melancholy. Her small, sculpted objects, drawings and paintings all share an affective tonality that spans the disparity of medium and content. 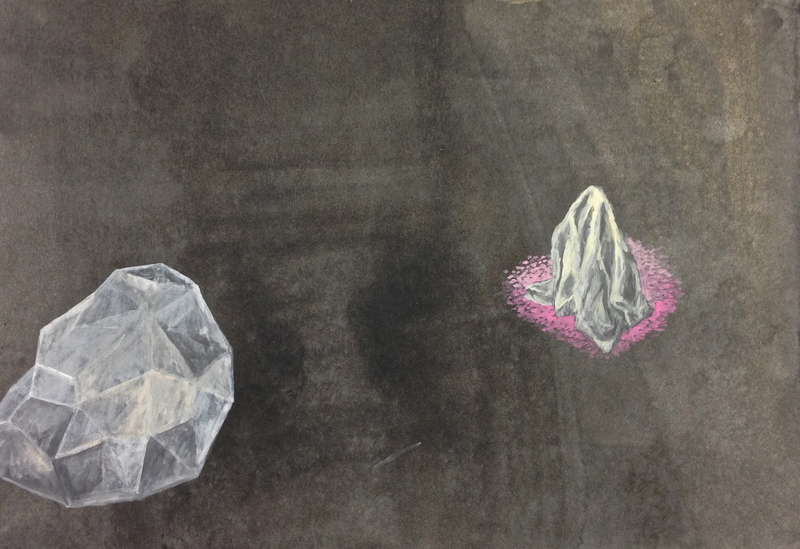 An egg with human legs, the drawing of a crystal and what looks like a dropped handkerchief, a greenish glass brick with the texture possibly of water, and a series of larger drawings of the human figure or body grafted to the leafless branches of a plant. Despite the range of material and content, these works all inhabit the same delicate universe, glowing with a grace that is sometimes perceivable in the awkwardness of serious children. Such children, caught in the conflicts of their transformation, execute their small, vastly consequential failures; their dropping of precious objects and their continuous falling down, with a grace that derives from the natural certainty of their metamorphosis. 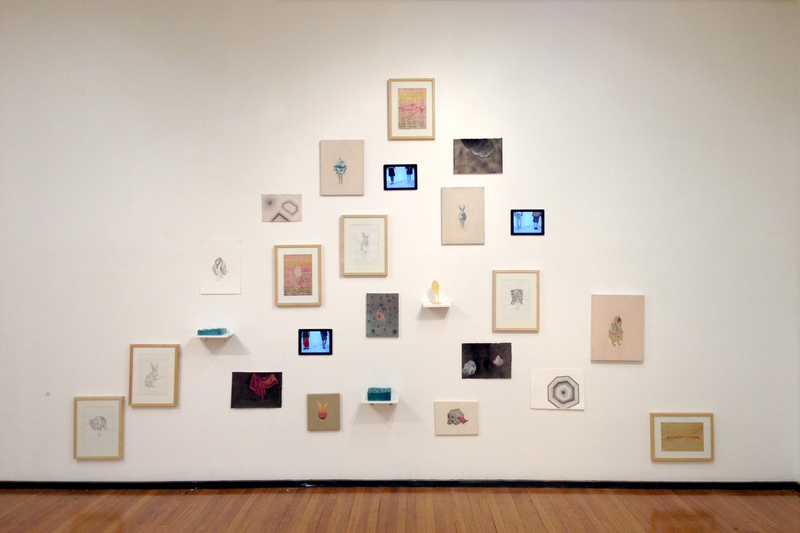 This theme of metamorphosis is treated in a series of drawings depicting plants grafted to the human body. The plants themselves are bare of fruit and leaf and it is uncertain whether they are living or not. One of these drawings depicts such a plant with all its joints taped together as though it was composed completely of grafting. Eventually you notice that the plant is standing on a single human foot. 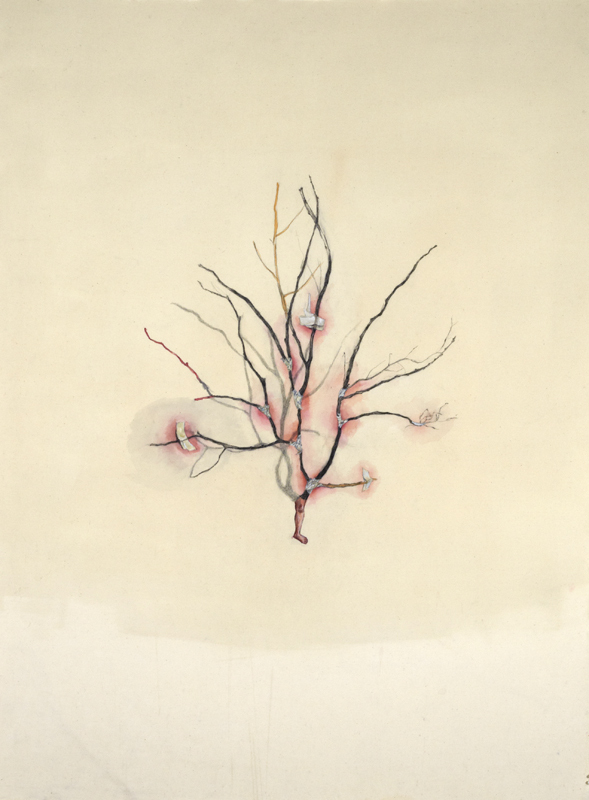 The joints of these grafts are all brushed with a wash of red watercolor, rendering them as wounds, as bruises. The plant stands there apparently barren, awkward, and wounded, the product of a creative endeavor that is either the futile taping together of sticks or the crafting of life itself into a form that will produce the dreamt of fruit. The figure of the egg, usually with human legs, also features in this body of work. In viewing this figure, the mind wants to see the legs emerging from the egg, but they do not. This is a fully formed being and yet, despite its obvious mutation, it has not yet transformed. It is almost as though the figure, instead of transforming into the creature it was intended to be, transformed into the figure of transformation itself. The egg stands blind and mute, awkward, tentative, and nervous, in a world of which it is not properly aware. Like that child, it is wounded by not knowing the context of its condition. This sorrow has the sting of the bruised elbow, the skinned knee. It depicts an awkwardness, an oddity that is hurt by its own sense of inadequacy: of not having quite got it right. Yet there accompanies this sense of frustration and disappointment an optimism inherent in the desire to transform; the ambition, the hope that catalyses all human metamorphosis. The egg stands blind, yet somehow gives the impression that it is looking at the horizon. In this figure, as in much of the other work in this body, Yiwon seems to imply that our capacity for hope, for joy even, is a precondition of the sorrows we gather throughout our life pursuing them. As in Vienna’s work, this conflict does not result in negation, but produces an affirmation that includes both terms.